Hi, I am Sharon. 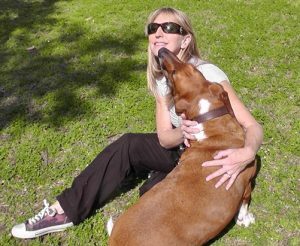 I commenced pet care in Perth in 1995. 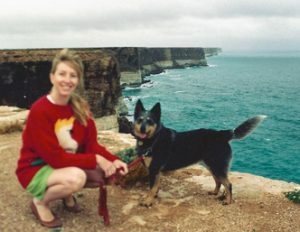 My inspiration for doing so came from my own personal experience whilst on a working holiday around Australia with my then fiance, Mark and our blue heeler, Phleg, as our trusty travelling companion. We flew home to Perth to marry during that time and Phleg flew with us, we knew no one well enough to leave her in the care of. You can hear her barking in the background of our wedding vows. I will never forget the first time Katie jumped onto my back while I was hunched over her kitty litter then proceeded to ride around on my shoulder. Or afternoons spent chatting endlessly with Sammy the 25 year old sulphur crested cockatoo. And I will always have a special place in my heart for Sam and Tigger, 2 staffies I walked for 9 years till their owners moved to NZ. I knew I could help other pet lovers by easing the angst they experience when planning trips on which their furred, feathered or finned families can’t join them. The years have been memorable. Those in my care have always greeted me with wagging tails at the least, with licks and slobber and over exuberant pouncing at the extreme. I have laughed at their antics, been proud of their achievements, been amazed by their grace and energy and been overwhelmed with sadness at the inevitable loss of a Pet Friends family member. 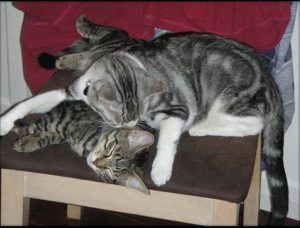 Our family has grown up with pet care as part of daily life. Our daughter, Paige was joining me on dog walks as a 1 year old in a pram. That’s her on the left walking Tigger. And just 3 days after our son Logan was born in 1996, I was back out dog walking with baby in a sling. Today I am honoured to be supported in my pet care mission by an equally dedicated and reliable team of obsessed animal lovers. Together we make sure the pets of Perth are cared for 365 days a year, rain, hail or shine. You can learn more about each of these inspiring women in the following pages…..